Previously, on MinerBumping... As part of our wonderful guide for new EVE players, the term "Codebox" was coined. Hurrah! So far, we've talked about some serious obstacles that new players face, and how they can be overcome. As a new player, most of your problems can be dealt with by reading MinerBumping and the Code. Others will require you to disable your safety or praise James 315 in chat channels. And, of course, you can save yourself much heartache by ignoring the advice of carebears and instead trusting in the Agents of the New Order. The final opponent who stands in your way--the most formidable of all--is you, dear reader. The threat posed by the "rebels" you encounter is trivial; they fail non-stop daily all the time. But to gain mastery of EVE Online, you must conquer yourself. Fortunately, this metaphysical task isn't that difficult if you get a little help from the Saviour of Highsec. You're in luck, because I'm always happy to help. Lesson #14. Your first "agent mission" is to collect 10 million isk and give it to an Agent of the New Order. Like most MMORPGs, EVE is designed to distract you and tie you up in layers of meaningless activities that suggest progression but actually go nowhere. As soon as you set foot in the EVE galaxy, the game attempts to nudge you into a pattern of completing "missions". Even if you complete these so-called missions, it's an empty victory. No one--not even you--will ever remember whether you were the millionth person to complete some NPC mission. Who cares? Achieving greatness in EVE requires you to resist, to reject the paths laid out by the game. The tutorial and all of the missions that follow are aimed at getting you into a pattern of obeying the commands of NPCs. If you submit to the NPCs, you will one day be no better than an NPC yourself. You will become a bot-aspirant. The Code has always been about putting humanity first, in its rightful position of superiority above the bots. Bot-aspirant carebears do precisely the opposite. They're traitors. We shoot traitors in highsec. The love of isk is the primary tool of the forces of bot-aspirancy. Even the most pitiable carebear would not be motivated by canned "congratulations" messages from an NPC when a mission is completed. It's all about the isk. NPCs reward new players with small amounts of it, in the hopes of getting the newbie hooked. Once a new player is consumed by greed for isk, even the NPC mission is no longer necessary; the newbie can grind isk by mining in an asteroid belt without NPCs to goad him on. Once we become aware of these facts, basic logic does the rest. For a new player to be destined for greatness instead of bot-aspirant greed, he must declare independence from isk. He must commit an affirmative act of defiance against it. The Code gives us the specifics: Give 10 million isk to an Agent of the New Order. This simple, seemingly trivial act is incredibly potent, especially for brand-new players. The amount of money is small--just barely enough to be noticeable by its absence. The new player knows that when he gives the isk to an Agent, he's not going to see it again. It won't be sitting in his wallet. He won't be able to admire the 10 million and say, "This is my intoxicating reward for completing all of those NPC missions, or shooting those rats, or mining all of that Veldspar." No, our Gallant newbie has chosen to give the money away. He says to himself, "I don't care about isk. I'm not beholden to it, nor am I tempted by its charms. 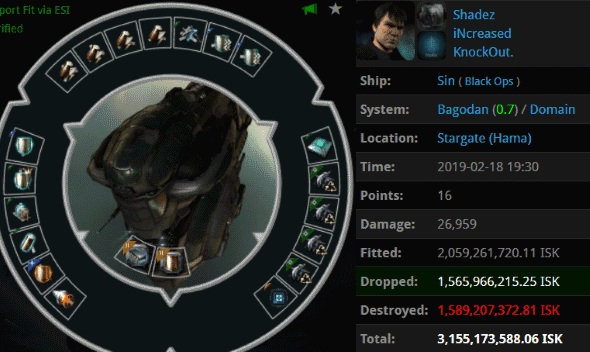 I do not play EVE so I can hoard isk for its own sake. I serve something of an infinitely higher value: the Code." The carebear who has lived his entire EVE career clinging to isk and crying over blown-up bling can never understand the transformation I have just described. Yet you can see its potential, because the bot-aspirant finds the idea of paying 10 million isk to an Agent unthinkable. It would require a transformation. Choosing the Code over isk, even in the smallest way, is radical. It's the stuff of revolutions. 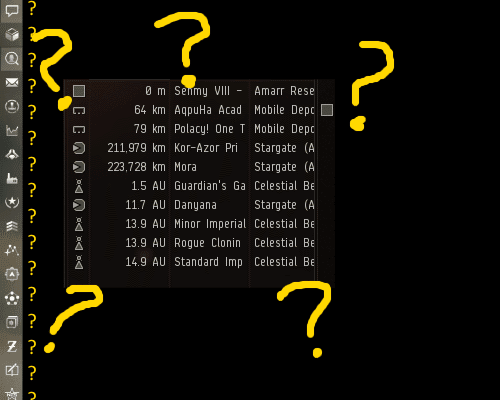 Having described the evils of the in-game mission system and the dangers of grinding isk, how is a new player supposed to acquire 10 million isk? Any way he chooses. He can scam for it, he can beg in Jita for it. He can go to lowsec and try to ninja-mine it. What matters is that he proves himself capable of handing it over to a proper highsec authority. That's a mission he can take pride in completing. Lesson #15. Move forward with confidence. We've come a long way, haven't we? From someone who was merely contemplating joining EVE for the first time, to someone who has successfully triumphed where so many others have failed. Once you've purchased a permit, you can consider yourself to have graduated to the next level. You're no longer a newbie; you're a mature young man or woman. The huddled masses of highsec yearn for your leadership! MinerBumping has many resources for the young Agent. You can find some useful links on the Become an Agent page or the Gank page. Seasoned Agents will be happy to give you further advice and instruction when they feel like it. Previously, on MinerBumping... EVE rejoiced at the creation of a much-needed guide for new players. Lesson #12. Don't let people stop you from having fun in EVE. You'd think this lesson would be unnecessary. EVE Online is a game--who would want to stop you from having fun in a game? The answer, actually, is that a lot of people would. It's unfortunate but true. As soon as you jump into the EVE galaxy, you'll be practically besieged by people who seem to want nothing more than to stop you from enjoying the game. My goodness, CCP introduced whole mechanics into the game aimed at that very purpose. Don't get me started on all of the nerfs to highsec fun that CCP has implemented over the years. It's not just CCP, though; it's the players. More specifically, it's the carebears. They say they don't enjoy PvP--and they're certainly not skilled at spaceship combat--but those who do the most to ruin other people's EVE experience are carebears. They're miserable (even when AFK, I suspect), and they want you to be miserable, too. The carebears prey on new players like you. They claim to want to protect you. From whom? The gankers? A ganker might destroy one of your ships. The carebear will destroy your will to play EVE--if you let him. Carebears do this by encouraging new players to engage in the most unpleasant, mind-numbing aspects of the game. They'll tell you it's not so bad, but look to their own actions: They maximize the time they spend AFK and, frankly, many of them use bots so they can avoid engaging in their chosen professions entirely. The worst are the carebears who organize themselves into PvE-oriented corporations or alliances. "We do a little of everything in this corp," they claim. It's a lie. All they do is grind isk--the more automated/AFK, the better. The paltry isk to be gained from this futile pursuit is their only reward. And they want you to have it even worse, by taxing you and by insisting that you sell them ore at below-market prices. They provide you with nothing in return, all while insisting that they have excellent leadership skills. If the corp/alliance is wardeccable, they'll display those leadership skills: "Everyone stay docked up and the enemy will get bored and go away after a week or two." Then they blame the wardec mechanics for the failure of this strategy. Naturally. The madness of these carebears can be proven, objectively, with some basic math. It takes 500 units of PLEX to pay for a month's subscription to EVE. Jita is currently selling each unit of PLEX for around 3.85 million isk, so that's a bit less than 2 billion. In American currency, the cost of a month's subscription ranges between $10.95 to $14.95 per month, depending on your pricing plan. So how many hours does it take a Retriever pilot mining Veldspar in highsec to earn eleven bucks? You can see where I'm going with this: Highsec is full of carebears grinding isk at a rate of pennies per hour. Far, far below minimum wage. PvE corps should be outlawed; they kind of already are. This might be explained away, if the carebears actually enjoyed what they do. But they don't. They avoid the actual act of PvE'ing as much as possible--even to the point of violating the EULA. Everything they do, they do for the isk. Which they spend on... blingier mining ships? Thanks to restrictions on RMT, they can't even say they're doing it for a little extra RL money. So they're doing something they don't enjoy, to accumulate small amounts of something they can't really use. No wonder they're miserable. No wonder they always happen to be in a bad mood when they get ganked. And, new player, they want you to be just like them. Lesson #13. Agents of the New Order are agents of mercy. The rebellious highsec miner, in his cold, dead heart, scoffs: "You're right. People do try to stop you from having fun in this game--the gankers. Your Agents want to tell us what to do. They don't let us enjoy the game how we choose." Agents play EVE as it was intended. They shoot spaceships in a spaceship-shooting game. Even better, they do it with style--better than anyone else. The highsec carebear is like the fellow who attempts to have "fun" by admiring a landscape in Call of Duty and gets surprised when bullets are volleyed his way. Simply put, the sightseer isn't playing the game correctly. Likewise, the AFK miner isn't playing EVE correctly, and the death of his Retriever is a natural, desirable outcome. Our Agents teach people how EVE is supposed to be played, and they teach by example. Mercifully, they freely share their wisdom, making it available to all. "I don't care," sneers the miner. "I only want to mine." 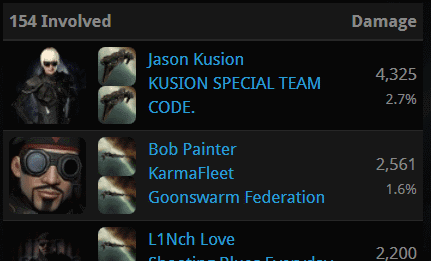 If you don't like the Code, go to nullsec. Go live in a wormhole. Why are you surprised when someone enforces the Code in highsec? "I shouldn't have to obey the Code. Highsec is a sandbox." No, you poor, deluded carebear. EVE may be a sandbox, but highsec is a Codebox. Previously, on MinerBumping... EVE's finest new player guide was published on the world's finest blog. As a new player, you should expect to spend the majority of your EVE-related time reading MinerBumping and rereading the Code. However, at some point, you will want to begin interacting with the EVE galaxy via the EVE Online client. Lesson #7. Seriously consider whether you really want to play EVE. Before you create an EVE account, take a day or two to reflect on the question of whether you want to become an EVE player or not. The time you have spent with MinerBumping thus far will inform your decision. Have your reactions when reading about the New Order and its Code been positive? Does the thought of enforcing the Code fill you with enthusiasm? If so, you're made of the "right stuff". If, however, you find that the adventures of our Agents make you recoil in horror, that's a red flag. Do you identify with the carebears and Anti-Gankers and the racist, profanity-laden death threats they spew after they lose their ships? Another red flag. Each day, our Agents act with almost supernatural skill and finesse to clean up highsec and make the world a better place. They are the defenders of civilization. 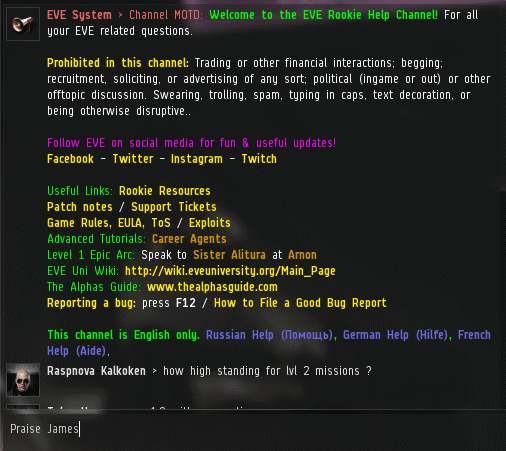 If you suspect that you may be a bot-aspirant, do us all a favor and don't sign up for EVE. That's the only way a Goofus can help save highsec. Consider it a redeeming act. And you needn't worry about CCP and its business goals: Technically, they haven't lost a subscription if you never signed up in the first place. Lesson #8. Create your very first EVE character. You can just select random stuff. Lesson #9. Praise James at the first opportunity. Now that you're in EVE, let's talk game mechanics. The little windows that you see are places where you can praise me or send other messages to your fellow EVE players. You know, you have a lot of advantages compared to a newborn baby. Whereas babies cry when they're born, a new EVE player can introduce himself to the world by making a constructive, meaningful statement. "Praise James" is that statement. You can type it anywhere: Local channels, NPC corp channels, new player channels, help channels. If someone sends you an invitation to join a private convo, you can type it there. Praising me in chat channels doesn't cost you any isk, it doesn't require skills to be trained, and you don't need to learn any game mechanics to pull it off successfully each time. Shout it from the rooftops! 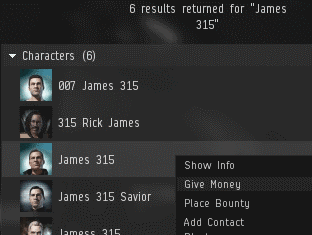 Saying the name James 315 elicits a useful reaction anywhere you go in highsec. It's EVE's most powerful filtering mechanism. A hundred thousand people play this game. How can you tell the good from the bad? Child's play. Lesson #10. You're better than the ordinary players. And yet you're already a better EVE player than everyone you meet who doesn't have the Code. Though our Agents are constantly improving the state of highsec, the place is still filled with a rabble of players who don't "get" EVE. Some of them may have a pile of isk and a few shiny ships, but they have absolutely no idea what they're doing. Lacking a mining permit, they're probably about to lose all the stuff they collected since the last time they got ganked. It's no secret; you already saw it when you spoke the words "Praise James" in a busy channel. Link the Code, too. The surge of power is unmistakable. You are instantly the commander of the scene. The rabble are compelled to react. The bad people scowl, they squeal, they squirm and shift uncomfortably in their seats. Whatever they had planned for the day comes to a grinding halt as they devote their full but limited intellectual resources into combating your revolutionary act. Or they are chastened--stunned into silence. 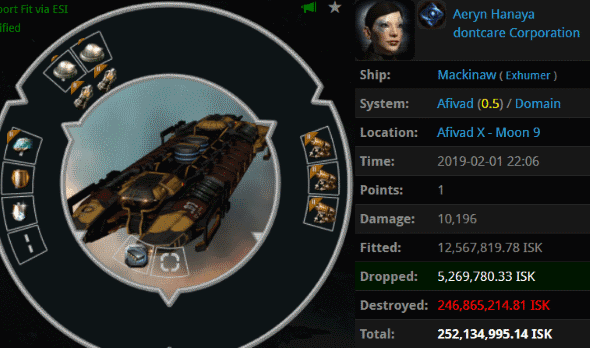 Now you have taken on the power and responsibility of being one of EVE's superior players. You have experienced what it means to be elite. You have become an Agent. You will always win. And you don't even have your first Catalyst yet. Previously, on MinerBumping... EVE Online got its first really good, comprehensive New Player Guide. If you've been following the guide, so far you've spent time familiarizing yourself with MinerBumping and reading the Code. Once you've done that, you're ready to take things to the next level. Let's dive right in! Lesson #4. Unlock your second achievement by reading the Code again. You could read the Code a hundred times and still collect new treasures. But for now, let's set the Code aside and focus on EVE the game. Lesson #5. There's much to be gained from reading old MinerBumping posts, even if you choose one at random. There are nearly 3,000 MinerBumping posts. It's an impressive statistic, but it doesn't even begin to tell you the sheer value that MB puts at your fingertips. Allow me to provide you with a couple of illustrations. Suppose you ganked a highsec miner and collected some of his tears, and then you posted the tears on the EVE subreddit. There's a good chance that your post would be upvoted to the top, especially if the miner's tears were especially entertaining. Yet that highly-rated post would represent the tiniest fraction of what is daily available on MinerBumping. It's difficult to describe how unique MinerBumping is, and how lucky you are to have found it. Try to find its counterpart for any other video game in existence, and you are sure to be disappointed. There's nothing like it anywhere else. It is a special gift to the human race. One more illustration. Imagine a planet like our Earth, one with small amounts of precious metals such as gold hidden across its surface. Now imagine a second planet. This planet is comprised almost entirely of gold. A gold planet! But it, too, has very small quantities of precious metals: Super-gold, as valuable compared to gold as gold is to dirt. Now imagine a third planet--a whole planet of super-gold. The super-gold planet has, for those lucky enough to find it, trace amounts of super-super-gold. Basically, reading MinerBumping is like finding yourself in a super-super-goldmine. Lesson #6. Put in the time, even if it means putting other projects aside. Let's go back to that quote about the axe. The point, of course, is that sometimes it's better to put more time into preparing for a task--and less in taking the actions to perform it. This wisdom applies to EVE. You could waste away many an hour by floundering around in the game, trying to figure out what to do. Or you could prepare yourself by reading the Code and reading MinerBumping. Then, when you do finally do fire up the EVE client, you can hit the ground running. That's how the best EVE players do it. "But James 315," you say. "I only have a limited amount of time to play computer games. Where am I supposed to find the time to do all of this reading before I even get to play the game?" Do you have access to a computer at work? "But James 315," you say. "I need to keep my job to pay the bills. I can't afford to get fired for reading your blog at work." Here's another statistic: The number of confirmed cases of people being fired for reading MinerBumping? Zero. By contrast, countless millions of people have lost their jobs for all sorts of other reasons. Even people who spend their time focused on "work" lose their jobs. Think of all the CCP employees who poured their hearts and their time into Dust 514, World of Darkness, "Walking in Stations", EVE: Valkyrie, Project Nova, etc., etc. So it's not like doing your job means you can't be fired. Then consider all of the people who have been fired for misconduct at work. Think of all the cases of abuse, the #MeToo movement, and all the rest of it. What if all those people had been spending their time reading old MinerBumping posts instead of mistreating their co-workers? No wonder no one's ever been fired for reading MinerBumping; companies could save millions of dollars on lawsuits. To say nothing of the human cost. One final point on this. Some places of business have an IT person who monitors how the company internet is used. I spoke to someone who does this as part of his job. I asked what he would do if the logs showed that one of the employees was reading MinerBumping. He said he'd probably buy the guy a beer. How do you like that? As you can see from the Kusion family home movie above, the festivities started off with a bang. 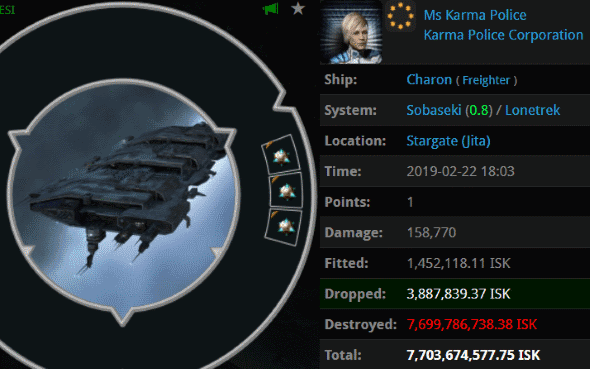 Ms Karma Police was caught near the Jita stargate and was given the dubious privilege of having her freighter ganked during the opening ceremony. No, I won't name all of the 154 involved on this kill. But I shall note that of all the gankers, Agent Jason Kusion did top damage. Of course, the New Order does not limit its ganking activities to one annual event. No, highsec burns all year round--and you can thank the cleansing fires of the Code for that. JIupuK70 certainly needed to be cleansed. He was (auto-)piloting a 756 million isk Covetor of all things. Agents D34dly D34dly and Slutzilla lit the torch. Alexandra Fischer was even worse. She went for the split-tank approach: Capacitor tank and bling tank. Neither worked. 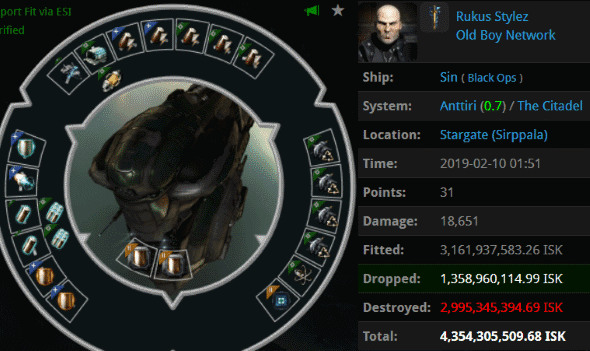 Agents Larsulrik Napsterbane and D34dly D34dly relished this 1.6 billion isk miner kill. Not every miner kill can be so juicy as the two preceding this one; some miners leave only a bitter taste. Re-Dial shocked and disgusted highsec with his "Whuh? "-fit mining Rokh. Notably, all three of these miner kills were scored in the Tash-Murkon region. One wonders if the region is home to evil spirits. Regardless, Agents D34dly D34dly, Davina Mustaine, and Larsulrik Napsterbane scored yet another KotW-worthy kill for the PKing Since Pong alliance. Our Agents have been on the lookout for blingy Black Ops ships of late. 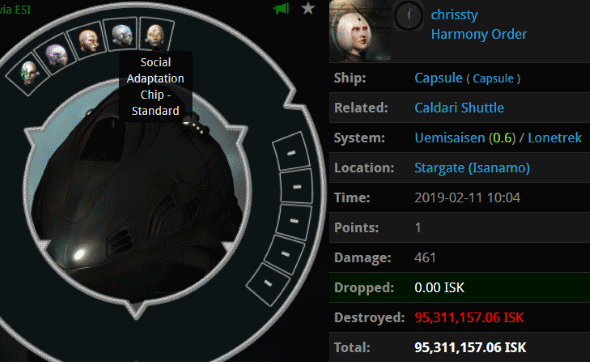 Shadez lost a 3.15 billion isk Sin to Agents Astrid Tyrfing, Narl' Amhar, Votre Dieu, and Rungerd. I'd make a comment about jump drives, but if jump freighters won't use them, what hope is there for Sins? How much can one lose in a lowly Bestower? When you're dealing with bot-aspirant carebears, the only limit is that of your imagination--and the carebear's stupidity. 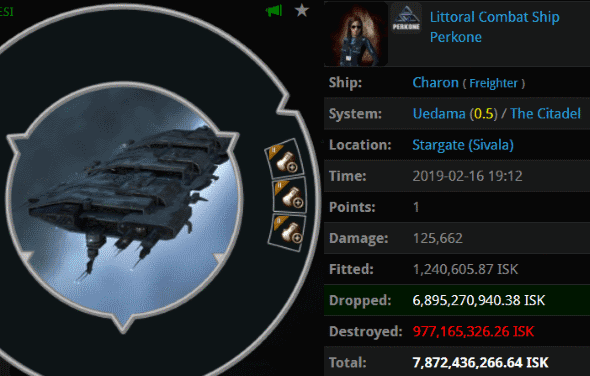 thedemonsofwar69 managed to lose 7.4 billion isk when her flimsy industrial ship was fired upon by Agent Narl' Amhar. The filthy hauler pilot was a filthy miner. Is anyone surprised? 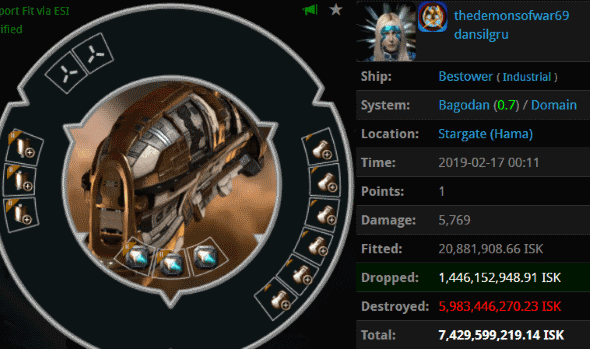 For the past several years, the EVE community has been abuzz with a lot of interest and concern regarding new players. Interestingly, the number of new EVE players has steadily declined during that time. (The decline has occasionally been interrupted by exceptional events such as major nullsec wars or the introduction of free-to-play accounts.) Though the amount of new blood has waned over the years, there has been an opposite trend when it comes to people claiming "new player" status and special privileges. 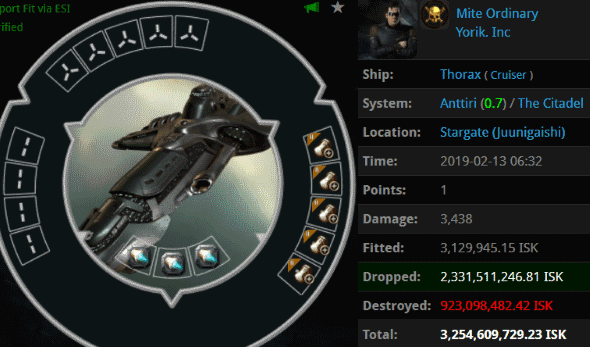 You can hardly throw a round of Antimatter Charge S into an asteroid belt without hitting someone who whines about being a "new returning player" or some other such nonsense. In short, newbies have become more trendy even as they've become less common. On multiple occasions, I have written on the hypocrisy of crusty old carebears who wrap their bot-aspirancy in the flag of newbroism. Nevertheless, there is one legitimate point to be made about how to improve the lot of the newbies--that is, the "new player experience" (NPE). EVE lacks a suitable tutorial. This, too, is something I've often remarked upon--especially the need for Code-related content in the tutorial. For reasons known only to the remaining CCP employees who work on EVE, the company has consistently failed to heed my recommendations on this matter. Apparently they don't care as much as I do about helping newbies and boosting CCP's revenues. However, the Code has never been about sitting around and waiting for CCP to do stuff. That's the carebear way. The Agents of the New Order are known for being proactive, innovative, and revolutionary. Unlike the carebears, we do not view ourselves as the victims of our circumstances. We seize the initiative and shape our own destinies--and everyone else's. Good for us! With that in mind, I have taken the first step in improving the NPE by creating the definitive EVE Online New Player Guide. If you know someone who's considering joining EVE, send them here. If you're one of the countless MinerBumping readers who has never actually played EVE yet, this post is for you. And if you are a potential EVE player who went online to search for a new player guide, hopefully Google sent you here. We've promoted their translation service enough; they owe us. Let's be honest: Starting EVE can be a daunting experience for a truly new player. 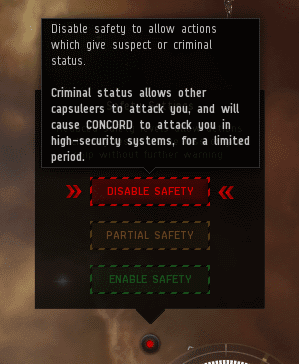 I've told CCP to do something about the game's 1970s UI with its indistinct, monochrome icons. New player, none of your struggles can be blamed on me or my Agents. We're the people who want to help you. Trust us and no one else. Lesson #1. Trust James 315 and the Agents of the New Order. You must assume everyone else you meet is lying to you. They don't want you to succeed, but we do. How do you cut through the clutter and get to the heart of the game? Don't go alone. If you're trying to follow the tutorial and claw your way up the EVE "learning cliff", you'll get discouraged. You'll probably quit and find something else to do with your free time, just like the vast, vast majority of other people who tried EVE. The only way you're likely to succeed is if you're invested in EVE before you even start trying to play. And even then, you'll need to listen to some good advice before you begin your journey. You don't learn to swim by being parachuted alone into the middle of the Pacific Ocean in the dead of night--a horrifying prospect. The good news is that there's a better option: Learn about EVE from MinerBumping. Lesson #2. Don't learn how to play EVE by signing up to play EVE, or by playing EVE. First, spend time reading my website. There is literally no reason why anyone should create an EVE account without first reading the Code. Of course, plenty of people are unaware of the Code before they start EVE. (And then our Agents introduce them to it--violently if necessary.) If you're reading this guide--if you're reading the Code--take comfort and satisfaction in knowing that you're already light years ahead of the other newbies, who, statistically, are almost certainly drowning in despair at this very moment. You know how a lot of games have "achievements" that you unlock by performing some task? 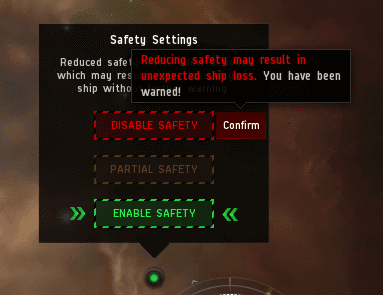 EVE has something like that, but naturally CCP botched its implementation. Never mind. 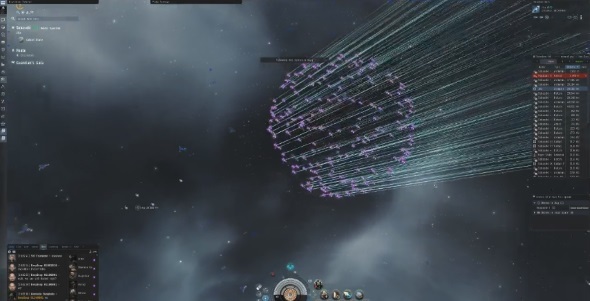 The best content in EVE is the content that the players make for themselves. Lesson #3. Unlock your first achievement by reading the Code! You're well on your way. Tim Galaxi's day started off with a bang. Agent Minx Mattel ganked Tim's Venture because the miner didn't have a permit. 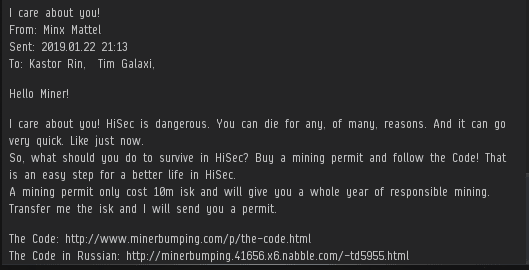 Tim lost around 4 million isk, but that's not much money--even for a highsec miner. It could've been a lot worse. Thing is, miners have a way of making things worse for themselves. 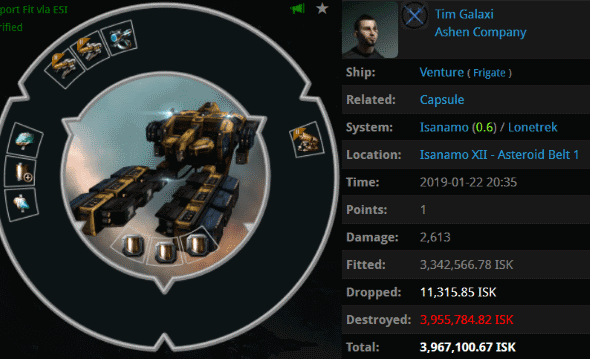 Tim managed to bring his loss up to 604 million isk for the day. A better question might be, "Why didn't you buy a permit before getting yourself blasted?" What began as a routine post-gank conversation took an interesting turn: Tim planned to circumvent the Code by hiring other carebears to do his mining for him. Usually people just buy ore from Jita, but whatever. Agent Minx was ready for him. Yes, it's illegal to hire others to commit Code violations. Don't try to be clever, carebears. Buy a permit--it's the cleverest thing you'll ever do. Luckily for Tim, he happened to be ganked by a permit-seller. Minx is a full-service ganker. No matter where you look, no matter what direction you turn, all roads lead to the same destination: the Code. When her convo with Tim ended without a permit sale, Minx sent the miner a form EVEmail. You might be surprised how much good you can do with a little copy-pasta. Tim poured out his heart to the Agent. She sensed that he was one step closer to Code-compliance. As usual, our Agent talked sense. It worked. Before long, Tim put Minx in communication with the miner's CEO and half-brother, Los Galaxi. Highsec smiled as Agent Minx rang up the sale of four new mining permits. 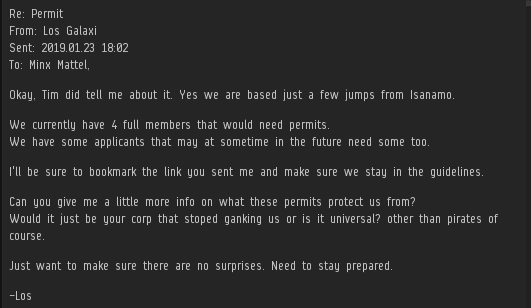 They say that every time a miner gets his permit, an Anti-Ganker sheds a tear. This may be true, but it's difficult to establish causation: Anti-Gankers are always crying and failing daily. There's definitely a correlation, though. More satisfied customers. Do these look like the victims of griefing, bullying, extortion, harassment, etc.? I thought not! A basic rule of life in highsec: Autopilot in a shuttle, lose your implants. chrissty of the Harmony Order corporation engaged in the obsolete practice of autopiloting her shuttle. Some people assume this is a convenient way to travel through highsec, but it cost chrissty 95 million isk. chrissty congratulated Agent Viirilithizu Ward on the gank. This would've been proper--if chrissty hadn't been sarcastic. Though chrissty tried to laugh off the gank, she couldn't let it go. She invited Viirilithizu to a private convo one minute after sending the EVEmail. The carebear joined EVE in 2010, but she acted as if she didn't know what was going on. Maybe she was going for that whole "new returning player" thing. Regardless, our Agent was happy to tell her about the Code. I mean, she did ask. If only life in North Korea was half as good as the highsec miners make it out to be. Pshaw. http://www.minerbumping.com/ has got to be the least dodgy link you're likely to see in the EVE client. MinerBumping has been visited over 6.4 million times, and in every case it's left the reader better off. When pressed, chrissty couldn't deny that she knew about the Code. With the possible exception of the Goons/Imperium, the New Order is EVE's most well known group of players. chrissty terminated the convo after vowing to continue autopiloting. But Agent Viirilithizu wasn't done with her just yet. The carebear belonged to a "small and close family" with nearly 300 members. Based on her encounter with chrissty, Viirilithizu was concerned about what was going on in Harmony Order corp.
After a brief investigation, our Agent felt there was sufficient cause to escalate the matter. Because the New Order values transparency, Viirilithizu informed the corp's leaders about the situation. chrissty had only been in Harmony Order for less than a day, and Viirilithizu's EVEmail didn't endear her to the corporation's leadership. 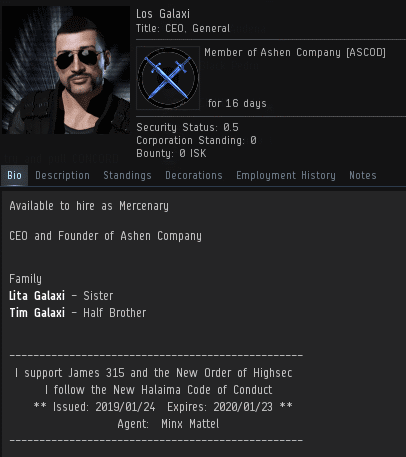 As we saw a few years ago in the Extraordinary Compliance Program series, highsec PvE corps and alliances often remove members who attract unwanted attention. For this reason, the tactic of EVEmailing corp leadership is only used in extreme circumstances or if the Agent feels like it. 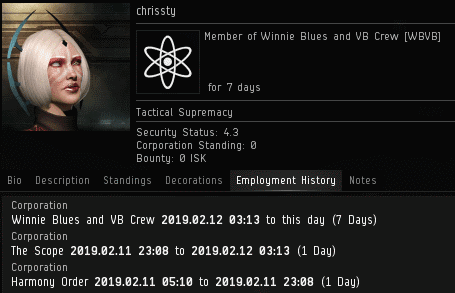 Harmony Order chose to kick chrissty out of the corp. She soon joined an alliance that holds sovereignty in nullsec. In other words, chrissty returned to where she belonged. With any luck, her days of shuttling through highsec are over for good. Previously, on MinerBumping... Agents of the New Order taught Aeryn Hanaya of dontcare Corporation how to care about the Code. It took three ganks and 1.5 billion isk worth of losses, but the miner finally began paying attention to what was important in EVE. Karma Bad > thats a belief in Code, that doesnt mean we are accepted into CODE. Though Aeryn was thinking about the Code, she did not yet have the capacity to think about the Code correctly. Instead, she made a spectacle of herself in the MinerBumping channel. Larsulrik Napsterbane > Aeryn Hanaya have you read on how to become an agent of the new order? Larsulrik Napsterbane > yeah i bet. The miner tried on a new excuse for her bot-aspirancy: She'd retired from PvP and was only interested in AFK PvE now. This would be like someone sitting in a corner during a Call of Duty match because they'd already logged too many hours in combat. Larsulrik Napsterbane > you did indeed. Lothar Mandrake > Aeryn Hanaya - you'll need a mining permit, may I recommend Aaaarrgg sell you one? Regardless of her allegedly storied past as an elite PvP'er, Aeryn had no right to violate the Code. 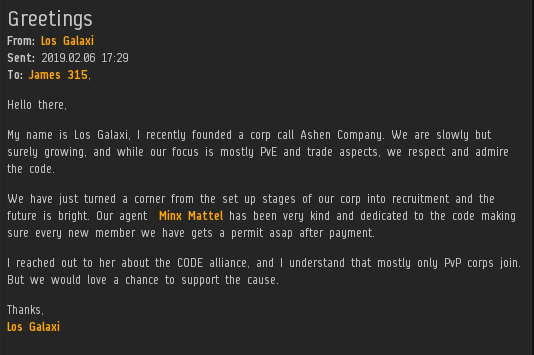 If enough miners had Aeryn's attitude, the New Order could become CCP and Pearl Abyss's favorite organization! The mighty CODE. alliance might just get a Community Spotlight yet. Next, Aeryn pulled out a common carebear tactic: She attempted to deflect attention toward some other Code violators. Why, you might ask, do people report bots to CODE. instead of CCP? Because deep down, they know we're the ones who fight for the good of highsec. Aeryn's CEO, AMARR DontCare, tried out another carebear canard: "Without miners, you'd have no ships!" Our Agents can shoot down that myth faster than an anti-tanked Bestower. 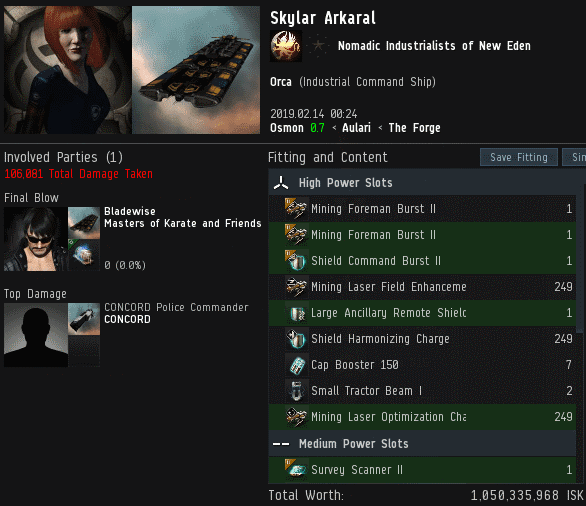 AMARR DontCare > i never play afk but that does not mean anything for you. so its irrelevant. AMARR DontCare > i have reported so many times of botters and yet you ignore it meaning you dont do what you say. It's fascinating to see how much the ordinary players rely on CODE. to deal with the botter problem these days. So much for CODE. being "bullies", "griefers", and "torturers". Lewak > larsulik you killed Aeryn Hanaya third time? As time went on, more Agents were drawn to--or returned to--the conversation. It was getting difficult to stay up-to-date on all of Aeryn's losses. Disgusted by the obvious lack of reimbursement isk headed her way, Aeryn and her CEO left the channel in a huff. Lothar Mandrake > This local chat message I received last week was so good, I slapped it in my Bio. LMAO! "- Oh no, why do you support CODE.? - Because no one else comes running when I find BOTS that need to die. Until you are willing to jump in a Catalyst and lose your security rating cleaning up High Sec, STFU!" Nevertheless, it was clear that Aeryn and AMARR were aware of their guilt. If they wanted to help deal with the bot problem, they could start by clearing the bots and bot-aspirants out of their own corporation. Aeryn chose to remove the mining permit from her bio rather than risk punishment for displaying an invalid permit. She claimed to be a happy miner. But as we all know, there is no long-term happiness in highsec without the Code. Previously, on MinerBumping... Despite owning a mining permit, Aeryn Hanaya of dontcare Corporation didn't care enough about the Code. Inevitably, her lack of concern led to numerous Code violations--and numerous ganks. In the space of about 90 minutes, she lost three exhumers in separate ganks. Slutzilla > Kill: Aeryn Hanaya (Mackinaw) third time lucky. Like many miners, Aeryn tried to pretend that the ganks were rolling off of her like water off a duck's back. Larsulrik Napsterbane > Aeryn Hanaya no we didnt! Larsulrik Napsterbane > lol you sound like you havnt read it! After the third gank, Aeryn broke. The solution for dealing with a stubborn miner is to keep on ganking them until their condition improves. Larsulrik Napsterbane > such as? Aeryn Hanaya > YOU want me to explayne ???? are you a member of the CODE or what ? Larsulrik Napsterbane > um no I am not a member of CODE. Miners have always had difficulty dealing with Agents of the New Order who aren't in the mighty CODE. alliance; for some reason it bothers them. Then again, miners are triggered when they see members of CODE., too. Aeryn Hanaya > read !!!! With three dead exhumers and a blingy pod loss, Aeryn had been set back a billion and a half isk. That's a lot of lost time for someone whose EVE career consists of mining solo in highsec a couple hours a day. Karma Bad > as a friendly diplomat, ill step in, so whats the problem tonight? The miner insisted that the gankers had violated the Code. She was wrong, of course. But on the bright side, she was making her case to the MinerBumping channel, so at least she was guaranteed a fair-minded audience. Aeryn Hanaya > like a titan tank ? Aeryn confessed that her two previous exhumers might have been a bit on the bot-aspirant side. Her fully tanked Mackinaw was in perfect compliance, though. Larsulrik Napsterbane > you call that tank? Larsulrik Napsterbane > even years ago that was not a real tank. "It wasn't tanked, but it was an old ship." That's a new excuse! Sorry, but the Code does not have a "grandfather clause". Aeryn Hanaya > read !!!!! The Code does, however, require miners to be respectful to our Agents. Larsulrik Napsterbane > big corpos? As a member of dontcare Corporation, Aeryn had indeed been complacent about important things like the Code. Alas, the ganks revealed that she only truly cared about isk. Aeryn cared more about money than the Code. What the heck?! Aeryn Hanaya > CODE is !!! Larsulrik Napsterbane > Aeryn Hanaya I never applied to CODE. Moreover, Aeryn was jealous of those who have been accepted into CODE. At least that part was understandable. Aeryn Hanaya > "For James 315 and the New Order! It was an honor to be a ganking Concord Martyr in the struggle against Bot Aspirancy! http://www.minerbumping.com/"
Aeryn Hanaya > what os this ? Larsulrik Napsterbane > my bio. there was no application involved. Despite all of her fuming and pouting in the MinerBumping channel, Aeryn's hoped-for reimbursement isk seemed to be drifting ever further from her grasp. Could anyone come up with a diplomatic solution that would satisfy all parties? Previously, on MinerBumping... AMARR DontCare went to the MinerBumping channel to demand an explanation for why Aeryn Hanaya lost her Hulk to a group of New Order Agents. Even as our Agents were explaining Aeryn's Code violations, the miner lost a second Hulk. Then she, too, joined the channel. Slutzilla > ships already been replaced.... i know. Though Aeryn started off ranting about Agents "violating their own Code", the miner was easily distracted. 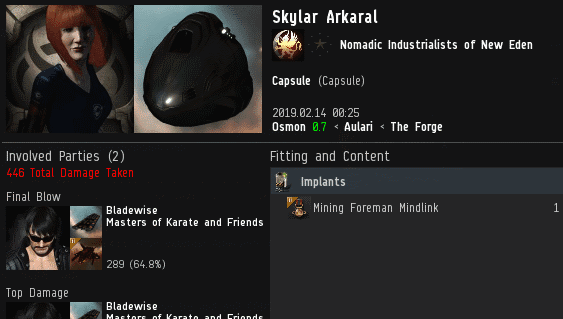 Aeryn Hanaya > Lewak placed 315,315 ISK in bounty on your head. 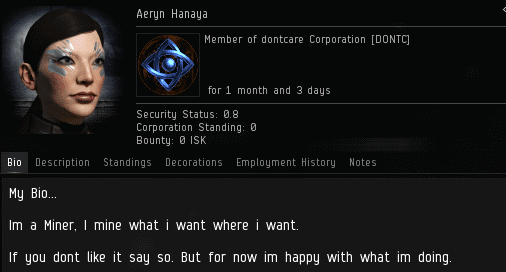 Aeryn Hanaya > dont you have more isk ? It soon became clear that there were good reasons why Aeryn managed to lose two Hulks in the course of one day: She and her CEO knew nothing of our Order. 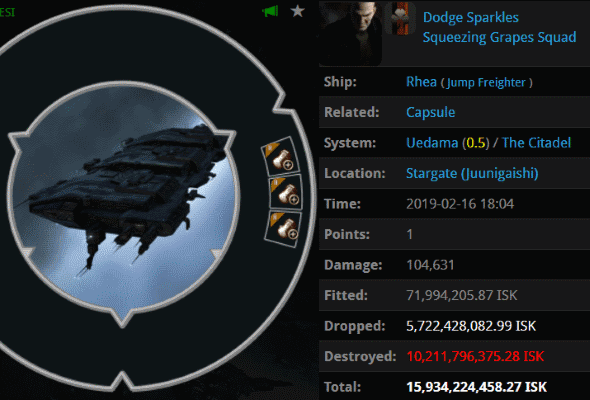 Lewak > for your code violating behaviour as well as disrespecting Mark of James your permits has been revoked and price for new permits increased to 30m isk, carebears. As CEO of the dontcare Corporation, it was AMARR DontCare's duty to keep Aeryn in line. He showed little interest. And the full depth of his criminal nature was about to come to light. 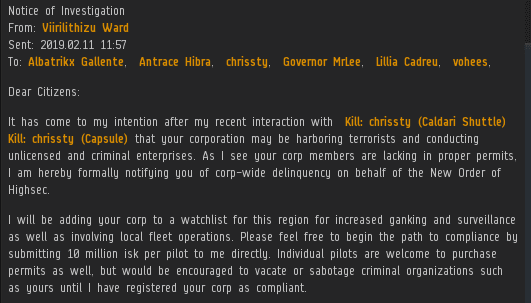 On each Catalyst lossmail, a member of dontcare Corporation was seen attempting to thwart the gank--including AMARR himself. Since CONCORD jammed the Catalysts before they were destroyed--and because the Covetor target was killed--the interlopers had no effect. Yet they were still guilty of obstruction of justice. Lewak > do you wish to buy new permit AMARR DontCare ? Failing to save his corpmate from justice, AMARR tried to play it cool. ...Yet the evidence of guilt was impossible to ignore. 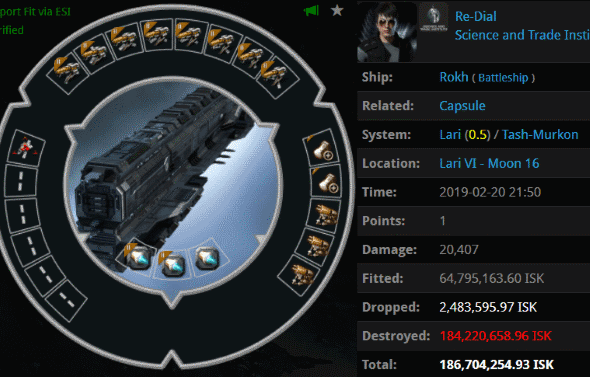 AMARR DontCare > and ? 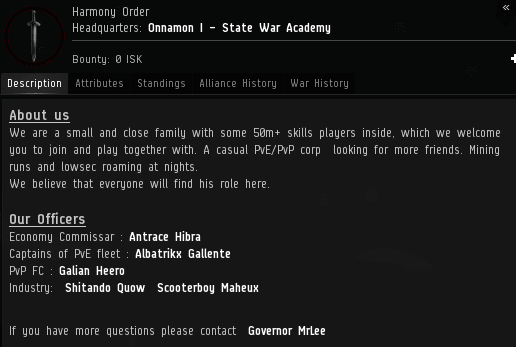 AMARR DontCare > you know how miners get. There was no denying it: Aeryn's double Hulk loss was no isolated incident. Something was rotten in dontcare Corporation. 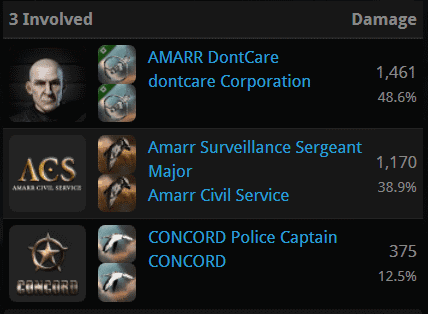 AMARR DontCare > how you figure that? And, as they say, the fish rots from the head. In Part 1, readers already perceived that this highsec mining corporation was a den of iniquity. Aeryn Hanaya > ok now say to me "happy birthday"or i will be upset ! In spite of her losses, Aeryn showed not the least bit of remorse. Nor did she appear concerned for her corpmate's loss. SWAGGZENEGGER > didnt u like the present? Aeryn was completely self-absorbed, just like every other bot-aspirant miner in highsec. I doubt it ever occurred to her to praise me--not even when she was losing her Hulks. As Aeryn indulged in frivolous talk about her birthday, she lost a Mackinaw, her third exhumer loss in barely an hour and a half. Would her dead Mackinaw finally snap her back into reality? Why would anyone bring a jump freighter into Uedama? Dodge Sparkles probably had no idea where he was going; he simply fired up the ol' autopilot and went AFK. He never arrived at his destination. Unless, that is, he always meant to be ganked by Agents Jackson Kusion, Jayson Kusion, Justin Kusion, Jake Kusion, Joel Kusion, Jayden Kusion, Jason Kusion, Joshua Kusion, Jeremiah Kusion, Johnathan Kusion, Joseph Kusion, Jeremy Kusion, Jacob Kusion, Josh Kusion, Jeffery Kusion, Jonas Kusion, Jack Kusion, Jimmy Kusion, Jessie Kusion, and Josiah Kusion. Skylar Arkaral had nothing but contempt for the suicide gankers of highsec. She never could've imagined that she would become one herself. Yet Agent Bladewise somehow managed to persuade Skylar to get into an Orca-on-Orca fight, which ended up with Skylar CONCORDing her own ship. We don't often see Black Ops ships featured on Kills of the Week posts, but Rukus Stylez's sinfully decadent Sin drew the notice of the local Tornado squad. It was popped by the expertly aimed artillery of Agents Narl' Amhar, Votre Dieu, Astrid Tyrfing, and Rungerd. It seems that our bot-aspirant adversaries are running out of ways to disguise their haulers. Mite Ordinary was afraid to use a freighter or even a Deep Space Transport, so he tried out a cargo-expanded combat cruiser. He failed. Agent Votre Dieu ganked Mite's Thorax, which had fewer hitpoints than the average Retriever. Given this carebear's foolishness, I almost expected the ship to be carrying Skill Injectors or PLEX, but no--it was a bunch of random garbage. Someone really wanted their cap boosted, eh? 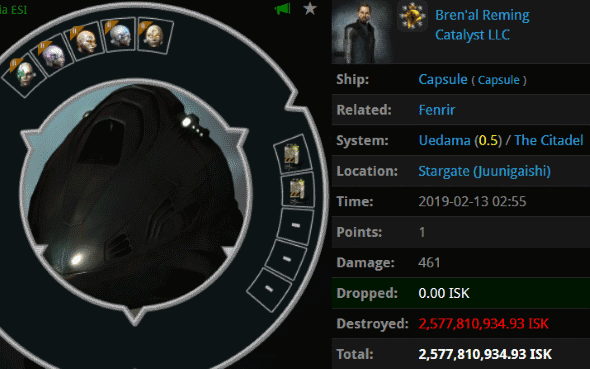 Bren'al Reming of the ironically named Catalyst LLC corporation got podded by a Catalyst flown by Agent Josiah Kusion, after the other Kusions destroyed Bren'al's 2.6 billion isk freighter. The mighty CODE. alliance uses quite a variety of ships these days, but we'll always be EVE's foremost experts when it comes to the Catalyst. "I don't want to pay 10 million isk," says the rebellious carebear. Lose a few billion, then.